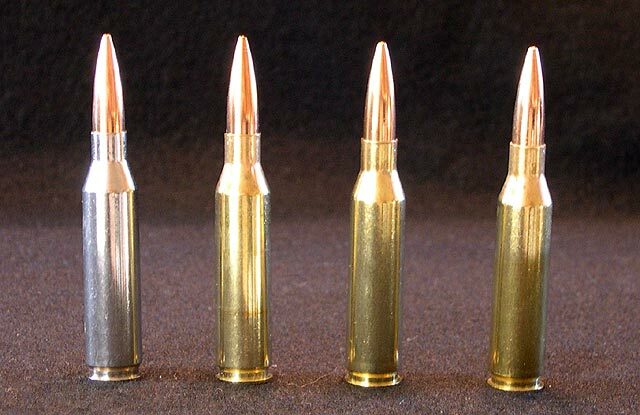 The 260 Remington is essentially the old wildcated 6.5-08, a 308 necked down to the .264 bullet. The 6.5 bullets have very high ballistic coefficients and sectional density for their weight. This makes for a light recoil round that has very good long range ballistics. The 260 has become very popular in sniper shooting competitions. The only down side is the variety (or lack thereof) of factory loaded ammo. Remington and Federal cartridge both load a 120gr and 140gr load for the .260, but neither one of them really makes use of the 260’s potential. The lack of match ammo really hurts us, but the 120gr ballistic tip loads do okay at long range. But recently the mid sized ammo makers have been making the push for good 260 match loads. Black Hills did a limited run of 139gr and may produce more in the future and HSM and Cor-Bon now have match 260 loads in their standard catalog. An interesting note is that the Lapua 123gr Scenar bullet has a BC of .547 which is better than the 30 cal 190gr Sierra Matchking (.533), and if it can be launched at 2900fps it will exceed the ballistics of the 300 Win Mag Federal Gold Match Load at long range, though it will not have the same energy. The Cor-Bon 123gr load does this and is a very good load. The Lapua 139gr bullet has a BC of .615 and if it can be launched at 2800fps it also exceeds the long range Ballistics of the 300 Win Mag. The Black Hills and Cor-Bon 139gr loads both achieve this. Overall, the 260 is a great caliber for mid range sniping (out to 1000 meters) in smaller to midsized weapon systems as it far exceeds the ballistics of the .308 and with less recoil. The round inherently has good accuracy and enough energy mixed with outstanding long range performance to make it a serious player. To top it off, the 260 does not have the same barrel burning problem as the 6.5×284. Barrel life should be good, though not as good as a .308. We are also working with HSM to develop a nice match load with the Sierra Match King 142gr bullet and they already list a berger 130gr VLD load that we would like to test as well. Do keep in mind that anything the .260 can do, the 6.5×284 can do better, but the ammo and brass for the x284 is expensive and when loaded hot, it is very hard on barrels, and the extra powder produces more recoil and sound signature. For a comprehensive review of the available .260 Match Ammo out there, check out our 260 Match Ammo Comparison test. Recommendation: The 260 will work good for military and law enforcement applications, though there is limited variety of factory loads and rifles. Penetration is a significant concern, as the sectional density of the 6.5 bullets can be very high, and penetrate deep, so watch for over penetration if your agency selects this cartridge. Note: The Cor-Bon 139gr was chosen as my preferred load for military applications. This load sends the 139gr Lapua Scenar bullet at 2750fps. This velocity is what Cor-Bon says it should be, but we saw that velocity from a 22″ barrel and from a 26″ barrel it was shooting at 2837 fps. Even at the slower velocity this is probably our preferred load as the heavier bullet bucks the wind better and offers better energy and penetration than the 123gr. The ballistics below are for a muzzle velocity of 2750fps (factory) but expect 2800fps with this load. The Cor-Bon 123gr would be another excellent choice and I have listed it in the chart as well. The factory lists the velocity at 3000fps, but even in a 26″ barrel we only saw 2907 fps, so I am going to list the ballistics at 2900 fps. Note: I have chosen the HSM 123gr Scenar loaded at 2800 fps. This load is a mild but very accurate load with the lighter bullet to help reduce over penetration. The recoil is very light for rapid follow up shots and the long range ballistics are still excellent as well. As usual, please develop your own test procedures and fully test all the available ammo before adopting anything as standard issue for your department.